The club has 4 all-weather sand-filled artificial grass tennis courts which were replaced in June2017, have a consistent bounce and which drain quickly after rain. The floodlighting on courts 1 & 2 make tennis playable all year round. The 2 switches are located in the club house, next to the telephone. Please remember to turn them off after play. During busy times it’s advisable to book a tennis court: see booking section. There is a mini-court for younger players & a practice wall for all players to practice their shots. If you would like to participate in either the men’s or ladies team tennis practice sessions or join the team competitions please see the contacts page. Aim: The aim of the singles mini tennis leagues is to provide tennis members with the opportunity of playing singles tennis with different players of a similar standard. Commitment: Depending upon division size, players will have approximately 4/5 matches to play every 5/6 weeks, but should play at least one match if they wish to be included in the next round. Match Scoring: The first player to win 9 games wins the match. The score, in games, should be entered as follows: e.g. If player ‘A’ beat player ‘B’ by 9 games to 8 then player ‘A’ gets a score of 9-8 and player ‘B’ gets a score of 8-9. A player’s own scores are entered on the horizontal (same general format as the squash leagues ie. symmetrical about a diagonal from top left to bottom right). Points: To encourage people to play, points are awarded as follows: 2 points for playing a match 1 point for each game won and 3 points for winning the match ie. a maximum of 14 points per match. Promotion/Demotion: Typically the two players with the most points will be promoted and the two with the fewest will be demoted. Some adjustments to these guidelines are often necessary as people join/withdraw. Joining: Players wishing to join/rejoin should add their details to the current leagues sheet. Indicate which division you hope to join. Assume 4 divisions with division 1 being the strongest. Walk-overs: Walkovers should be recorded as w/o in the challengers box and – in the box of the player who calls off. For further information please contact the organiser via the contacts page. Social tennis every Sunday from 2 pm – 4 pm. See below. The club hold an annual tennis tournament for all players, usually around the first or second Saturday of September. Singles, doubles, mixed & handicap matches are all held & trophies competed for. The finals are also a good excuse to light the BBQ. 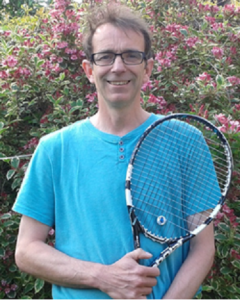 Our full time tennis coach, Richard Axton (pictured), is available throughout the year for private coaching for members and non-members. Richard is a LTA licensed coach and qualified to run cardio tennis sessions. Individual and group lessons for all ages and standards can be accommodated. There are adult group sessions open to members and non-members on weekday evenings. Richard also runs a junior tennis programme (5-18 years old) with sessions midweek and at weekends. There are holiday clubs during Easter and summer holidays. For further information please contact Richard via the contacts page. NB: If non-members decide to join after they have had non-member coaching sessions; they will be reimbursed 5 sessions worth of additional fees paid for coaching. To avoid damaging the playing surface please only wear appropriate ( no heel) footwear on the courts. The committee have entered into a regular maintenance contract with a local company in order to keep the courts in the best condition possible and to try and ensure their longevity. However, please do use one of the drag brushes, after you’ve played, to help re-distribute the sand, remove leaves and discourage plant growth etc. Book a court via the booking section page. Dean Ladies Team finish in 3rd place in East of Scotland League Division 7B. 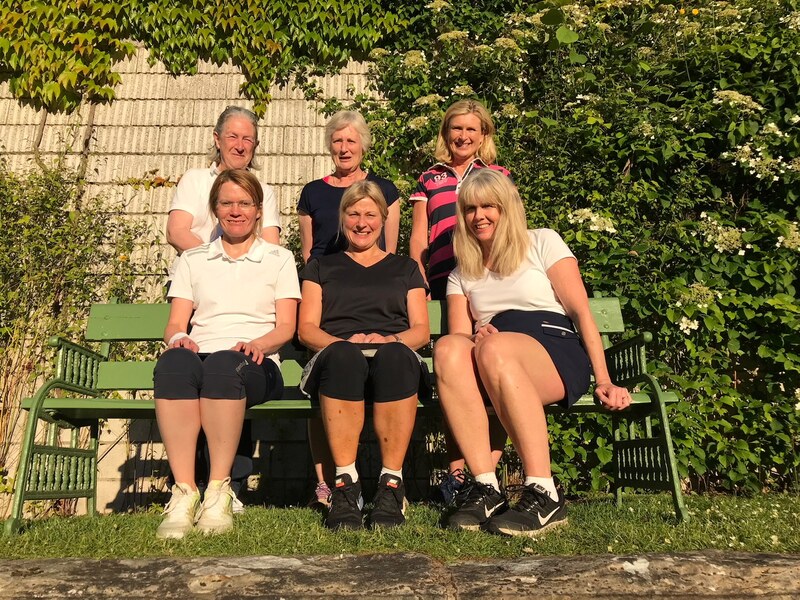 Dean ladies tennis team (pictured) have had another successful year finishing a close third in their league. 16 ladies have played for the team this year and we have all enjoyed some competitive tennis and lovely weather! For more photos see the Photo Archive page.